I thought I would take a little break from what passes for frantic production and share a little of what I have been doing whilst on holidays. 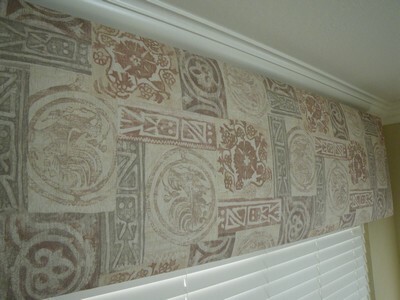 I bought the fabric for the valances at a place down here called SAS Fabrics. What an adventure that was. It’s a big warehouse, bad lighting, no heating or air conditioning, dusty, and only marginally organized. If you are a sewing person (I was going to type “sewer” but that didn’t look right somehow.) this is a fun place to go. I got enough fabric for the valances and had enough left over to cover 2 cute little pillows for my IKEA chairs. 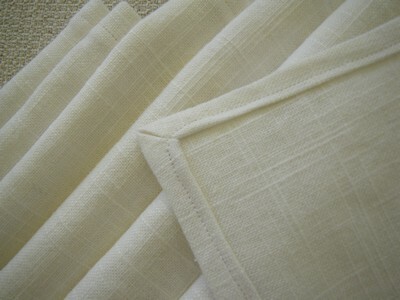 4 yards of drapery cotton for $20.00. The whole store is full of great deals. 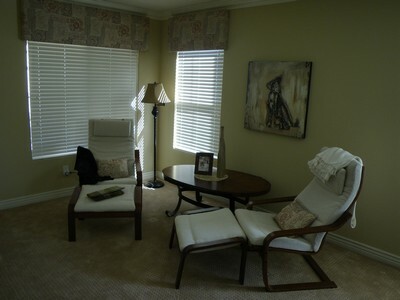 and the room is now much lighter, and feels like a place I could stop and read, or maybe have a nap. 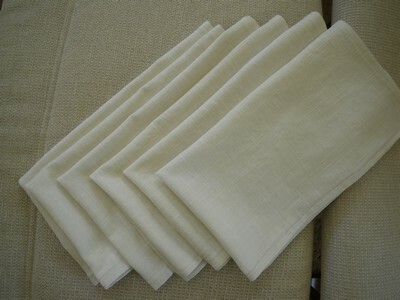 While I had the sewing machine out, I hemmed some linen tea towels. The idea came from the Purl Bee, and I am sure that I am the last person in the whole world to discover this wonderful site. Anyhoo, back to the tea towels. 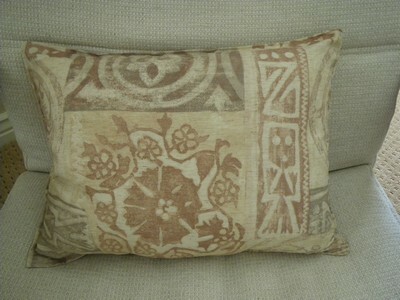 I don’t really like working with linen; it’s too independant, but I persevered and am quite happy with the results. Has there been knitting? Why yes, there has been knitting. Scarf-Red Heart Boutique Treasure. Surprisingly decent fibre. 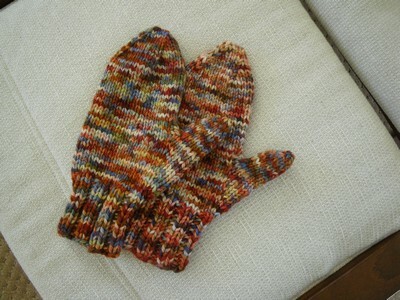 Meritwist Handpaint mitts- not my best effort. We will not speak of these again. 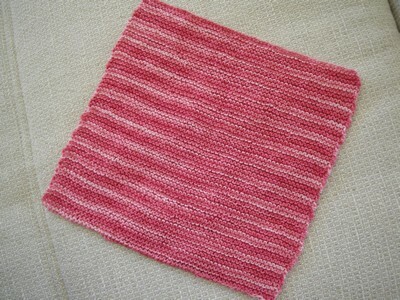 Baby Washcloth. Garter Stitch. What was I thinking? Snore. Circulo Anne. Nice cotton. Needs doubling. Uncharacteristically, I have even done a wee bit of crocheting. 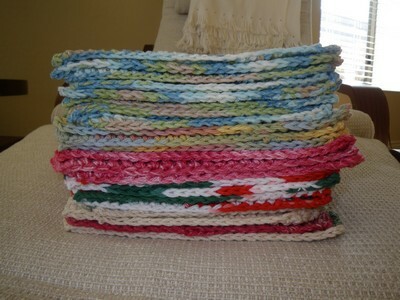 Mostly square dishcloths. Crocheting is not my forte. I have one more week here. Andy and 2 of his buddies are coming down on Friday, so I will pick them up at the airport and drive them around for a few days, read them the riot act about behaving and how to close up the house when they leave for home, and then fly home and leave them to their own 23-year-old devices. I don’t wanna know. I’ve still got a couple more projects to share, but I have to go and eat some random snack now. And not do my dishes. 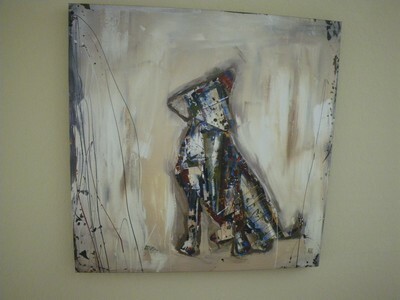 I was so happy that I got back from holidays in time to head on over to Prairie Lily last week. Charlene was having her big fall sale, and it was a gooder! I met Terri for tea and goodies (packed my own picnic- I told Charlene if I’m going to be entertaining at her store, the least I could do is bring the fixings. That and enough coffee to offset at least part of what I have consumed there over the years.) and we did a little visiting and a little shopping. It’s funny how you look at fibre differently depending on what you plan to do with it. Right now I seem to be a little obsessed with Simon Baker weaving, so every choice seems to be a function of that. 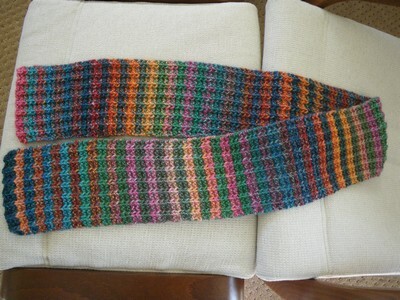 Along those lines, I got brave and tried to add a few floats to the most recent scarf. I promised Mike I wouldn’t warp for the next scarf until I had our company books ready to go to the accountant for yearend, but I’m having trouble getting the stupid frickin’ files transferred to the thumb drive. I really hate stupid Windows Vista, and the stupid accounting program I had to switch to because of stupid Vista, and the stupid computer (which I suspect is woefully under-memoried) and having stupid real life interfere with my fun. At least I don’t have a spider crawling down my pants. I have followed the Yarn Harlot’s escapades with Mr. Washie with some interest. Laundry is the one household chore that I actually enjoy doing (because you can work really hard putting in a load, and then sit down and knit until it’s done), and I’ve had a recurring problem over the years with mysterious spots on Mike’s t-shirts. It wasn’t personal until they started appearing on my clothes, so after the usual maintenance checks, changing of detergent, fabric softenenr, etcetera and so forth, on Tuesday I emptied out my “fun money” account and bought a new washer and dryer. Went with top load (for felting purposes) but 4.5 cubic foot capacity (king-sized bedding- friendly!). I shopped without Mike, and actually got the features I wanted. Now, my husband is a darling, but if it was left to him, all laundry would be done on the heavy duty cycle, warm wash cold rinse, and dried until crispy. The subtle nuances of different cycles are lost on him. (“What is this “gentle” cycle? Why would we use that?”) I have known for years that he is the embodiment of Not Reading Labels, Directions, or Instructions. I had purchased a pair of classic wool pants, lined, far more expensive than the budget could stand (but I was going to wear them for years), ****dry clean only***. I came home one day, and Mike (who I didn’t think even knew where the laundry room was) had done some laundry. On top of the dryer was a green sodden lump. I held up by the waistband what used to be my pants and shook them gently. The lining fell gracefully to my ankles, and the pant legs fell damply to my knees. I walked into the living room and asked “What happened to my pants?” Mike replied in a “gee I’m clever” kind of voice “I took those out of the washer and thought “I bet these don’t go in the dryer!””. Silence. Disappointment. Tired resignation that at least he tried. Then recently, as the laundry spots became an issue on his t-shirts, I started to do the math of how many t-shirts (which can still be worn under a sweatshirt, after all) it takes to make up for one pair of totally ruined pants. I think we’re approaching even. The hat is from Canadian Living Magazine (January), using Patons Rumor. It should be appearing on the website soon. 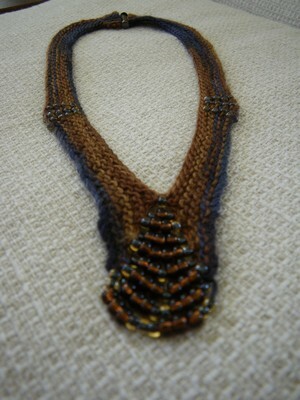 It was a fun knit, although my gauge was a little tight (maybe because I was stressed when I was knitting it?) so it’s gone to the church with my mother to decorate the “woolly tree”. And now, just in case anyone is feeling overwhelmed with his or her life, and all the complications which seem to consume us every day, I ask that you check out Kody May Knits. Whether or not you get involved in social and justice-related causes, or just say a few quiet words to whomever you say quiet words to, please remember Kody May and Randy. What they are going through right now makes my complaints and concerns seem petty and unimportant. When people say “Don’t sweat the small stuff”, that’s okay, but then when they follow it up with “It’s all small stuff”, well, that sticks in my craw. Kody May and Randy are not sweating small stuff; this could be the fight of their lives. Literally. I believe that the contemplative side of knitting need not result in the gifting of the object being knit to the person you think about or pray for while you are knitting. Please use at least a little of your knitting time this weekend to send good vibes to people who really really need them. And don’t sweat the small stuff.